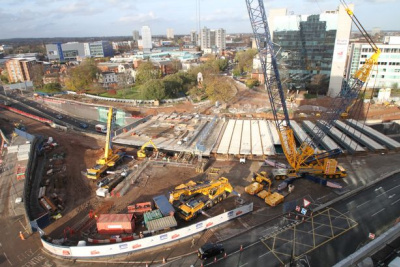 Coventry's Friargate project has scooped the top prize at an annual business awards ceremony. The development and Coventry City Council picked up the Deal Of The Year award at the West Midlands Business Insider awards this week. The council beat off competition from two Birmingham developments – Priory & Temple Court and 55 Temple Row. The award was presented to Coun Kevin Maton at the Hilton Birmingham Metropole. He said: “This award really is the one everyone wants to win because it celebrates good partnership working and nothing is achieved without the ability to work well together. “I know that Coventry is a great place to do business but it’s very nice to have this recognised by property professionals. We have a great team at the council, working to create jobs and opportunities for local people, and this award recognises all of their hard work. “We are determined to make our city great again and, when fully developed, Friargate is set to bring up to 15,000 permanent jobs to the city and 7,800 jobs in construction. It will create Coventry’s first ever business quarter and vibrant new public realm linking the scheme with the city centre." Steven Reynolds, of Friargate Coventry LLP, added: "This award recognises the importance of Friargate to the city of Coventry. The City Council has sent a loud message to the market that Friargate is the pivotal development to transform the city’s business offer. "I feel certain that the City Council’s confidence in Friargate will act as the catalyst to attract new occupiers to the scheme." Insider's property awards have been taking place for almost two decades and they celebrate the quality and breadth of business across the region as well as showcasing achievements. In their comments the judges praised the way the development is set to change the city and Midlands Business Insider editor Kurt Jacobs said: "Look how much our urban skylines have changed over the past year. And I don't mean just Birmingham with its new library, or new New Street, but developments such as the new bridge over the ring road that will transform Coventry."